The U.S. military's mysterious X-37B space plane willcomplete its maiden voyage with a return to Earth as early as Friday (Dec. 3),Air Force officials said today. Personnel at Vandenberg Air Force Base in California are preparingfor the return of the unmanned X-37Bspace plane, which has been aloft on its classified debut spaceflight sinceApril, officials with the Air Force Space Command said in a statement released today(Nov. 30). The X-37B, also known as the OrbitalTest Vehicle 1, launched atop an Atlas 5 rocket on April 22. Since then, ithas been circling the Earth performing a mission that has been shrouded in secrecy.What the reusable spacecraft has actually been doing is classified, as is its mission's cost, Air Force officials have said. While the Air Force istight-lipped about the X-37B, skywatching sleuths have been making guessesabout the robot plane's mission based on its movements across the sky. Some amateur gumshoes, forexample, speculate that the X-37B is testing experimental reconnaissancesensors as a roboticorbital spy, helping officials gauge their performance before taking thecostly step of integrating the sensors into free-flying systems. 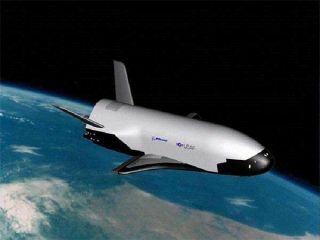 The reusable X-37B Orbital Test Vehicle 1 was built byBoeing Phantom Works and is designed to stay in space for up to 270 days usinga solar array to generate power. The X-37B vehicle is about 29 feet (9 meters) long and has awingspan of just over 14 feet (4 meters) across. It stands just over 9 1/2 feet(3 meters) tall and tips the scales at nearly 11,000 pounds (about 5,000 kg). This SPACE.com X-37B graphic illustrates some details of thespace plane and its relative size. The craft's payload bay is 7 feet (2.1 meters) long by 4feet (1.2 meters) across, about the size of a pickup truck bed. It will land muchlike NASA's space shuttles, which descend on an unpowered glide and touch downat about 200 mph, analysts have said. Given a successful re-entry, the space plane should navigateitself to a touchdown at Vandenberg in autopilot mode. If the plane strays offits trajectory over the Pacific Ocean, the craft can employ a destructmechanism. Edwards Air Force Base, also in California, serves as backupto the Vandenberg landing strip. The X-37Bprogram is under the banner of the Air Force Rapid Capabilities Office inWashington, D.C., with one job description dedicated to demonstrating areliable, reusable, unmanned space test platform for the United States AirForce. The spacecraft was initially built as part of NASA projectuntil 2004, when it was shut down for lack of funding. The project was thentransferred to the Defense Advanced Research Projects Agency, or DARPA, withthe Air Force taking over in 2006. ? The space plane is being operated today under the directionof Air Force Space Command's 3rd Space Experimentation Squadron, a spacecontrol unit located at Schriever Air Force Base in Colorado. A second X-37B ? called Orbital Test Vehicle 2 ? is also indevelopment, headed for a test mission slated for 2011.